"This is so easy to prepare and everyone raves about it. The best part is that you can put it together the night before and just pop it in the oven the next morning. Delicious!" 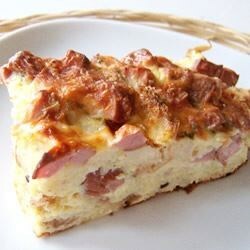 A simple, savory baked egg casserole with plenty of ham and cheese. The flavor wasn't bad, but getting past the texture was rough for both my husband and me, and not one of four kids would have anything to do with it.